The McCarty's Sacro Ease Sports Portable designed to give superior back support while still being ultimately portable. This is a portable BRSM Stadium Seat. Complete with lumbar pad on the inside; the bottom is skid and wears resistant with water resistant durable fabric as the main covering. The strapping is adjustable and allows this unit to be a stand alone unit‚ requiring no back to lean against. Can also be used in the car if you unbuckle the straps. The steel frame and rubber support help this back cushion provide far more support than any foam only products. This seat will provide maximum comfort while supporting your spine. The Sports Portable can give an old seat new life by adding a supportive, ergonomic backrest. The Sports Portable can reduce muscle tension and stress related to sitting in unsupportive chairs and seats! 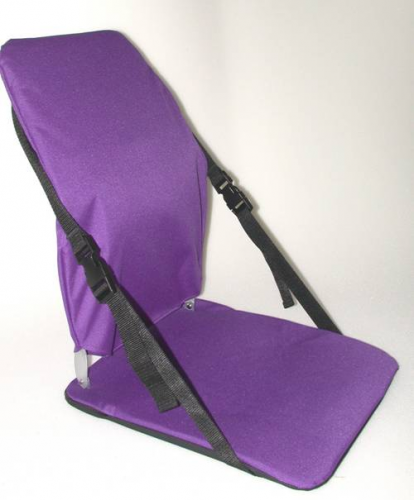 It can be used in stadiums where there is no backrest to lean against. The strapping system allows you to tighten or release the straps to compensate for a non-supportive seat. If unbuckled it can lay flat. When driving with it simply unbuckle and enjoy! Provides superior lumbar support when positioned behind the back. Made with very durable water-resistant fabric. Made with an adjustable (bendable) steel frame, rubber supports, and gortex like fabric.